We're almost out of the standard DNA that we use in our transformation assays. It's chromosomal DNA of a strain called MAP7 (because it contains point mutations conferring resistance to seven different antibiotics). So I grew up a liter of cells and prepped DNS from them. Now I have 25 ml of nicely viscous DNA solution. It's transparent and colourless but I suspect it's not really pure yet, so I'm doing a second purification on 0.5 ml just to check if the apparent concentration or purity changes when examined with the Nanodrop spectrophotometer. I'll also do test transformations, with the last of the old DNA preps as a control. 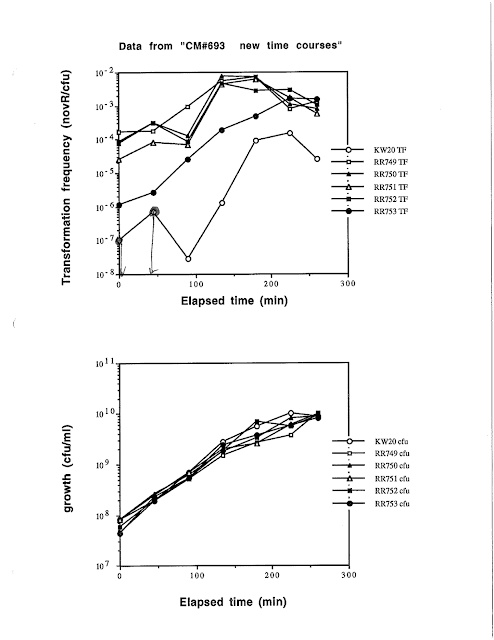 Later: The Nanodrop spec found that the repurified DNA had half the concentration of the big stock. So I ran a gel and found that the big stock still contains a lot of RNA. My original RNase step must not have worked very well, probably because of the high concentration of SDS and of proteinase K. So I';ve now incubated the prep with more RNase overnight. The RA's missing notebook hasn't turned up, so I don't have her notes of how she prepared the samples for the RNA-seq analysis. Luckily the main procedures are ones she used in many experiments and are described in her earlier notebooks and in an email she sent me. Grow cells to desired state in rich medium (sBHI) or competence medium (MIV). Mix 2 ml with 4 ml RNAprotect reagent (Qiagen); leave 5 min at RT. We have 100 ml and can get more quickly through LSC Stores. Mix 2 x 1 ml with 0.25 ml 80% glycerol and freeze at -80°C. (for later competence assays). Pellet RNAprotect cells and freeze at -80°C. Use Qiagen RNA prep kit. We have lots and can get more quickly through LSC Stores. Don't use the DNase step. Elute in 40 µl H20. Measure concentration of 1 µl with Nanodrop. Run 4 µl in a 1% agarose TAE gel at 60V. Use the 'Bioanalyzer' (high-tech equivalent of gel electrophoresis) to check the size distribution of the RNAs in each prep. Expect to see 2 strong rRNA peaks. Use Ribo-Zero kit to remove the rRNA from each sample. Use the 'Bioanalyzer' (high-tech equivalent of gel electrophoresis) to check the size distribution of the RNAs in each prep. Expect to see no rRNA peaks. 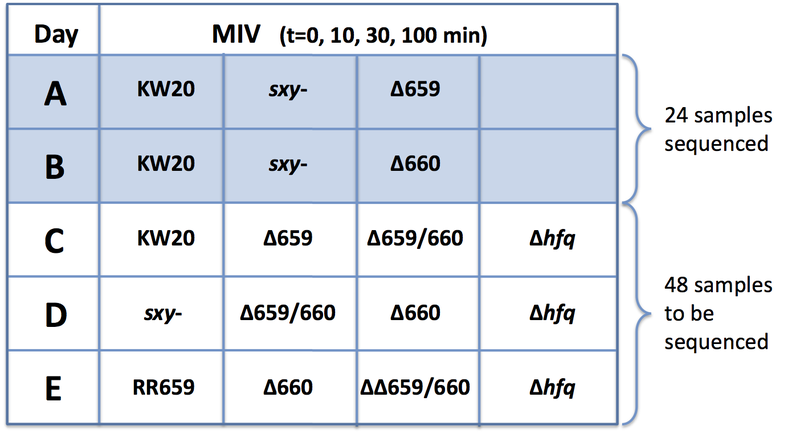 Here's the chart showing the MIV-competence samples I had planned. I'm only going to do one set of the ∆hfq strain now, because our procedures aren't optimized for small RNAs (poor recovery and no strand information). One of our summer-Honours students will be working on this mutant, and he can take my preliminary data and use it to help design an optimized RNAseq procedure. So I think on Day C I'll only do the three strains (sxy-, ∆659 and ∆6759/660), and if this goes smoothly scale up to four strains on Day D. Maybe on Day E I'll replace the ∆hfq strain with something else I want preliminary data about. I've been saying for ages that I need to learn the statistical programing language R, so that I can work with all the bioinformatic data we're generating. So yesterday I looked through the Coursera offerings and found an introductory statistics course that taught R (Data Analysis and Statistical Inference, taught by Mine Cetinkaya-Rundel of Duke University. It started a few weeks ago, and I've spent yesterday watching the Week 1 videos and doing the Week 1 R lab. The labs are excellent. They use a web-based R learning platform called DataCamp - each lab is a long series of guided exercises: with each exercise you're given a bit of instruction and asked to use it to display something or graph something or calculate something. Integrated multiple-choice questions check your understanding - DataCamp automatically sends your results back to Coursera. It's also very good that they're part of a basic statistics course, since I've always been disgracefully ignorant of this. The video lectures are good -short but many, and aimed at the complete beginner. I was initially quite pleased to be learning what 'marginal' means, and the differences between variance and standard deviation and standard error. The course materials are very well designed. But I started getting frustrated when I tried to think more deeply about quantifying variation. I can sort-of understand why we want to know how variable the members of the population are, but this was never really explained, and I have no idea why we measure it the way we do. To me it seems simplest to measure variation by calculating how different each individual is from the mean (the deviations), summing the absolute values of these and dividing by the number of individuals. But that's not what's done. Instead we square each of the deviations and sum that, to get the 'variance'. But we don't use the variance (at least not yet), instead we take its square root, which we call the 'standard deviation' and use as our measure of variation. Why is this cumbersome measurement better that just taking the mean of the deviations? The instructor doesn't explain; the textbook doesn't explain. In the first lecture of Week 3 we come to something called The Central Limit Theorem'. This is apparently a big deal, but I don't know what the point is. We've moved from considering the properties of a single sample from a population to considering the properties of many independent samples (size n) from the same population - I have no idea why. The Central Limit Theorem tells us that, if we take many samples and calculate the mean of each one, the mean of these means will be the same as the population mean (is this not expected? ), and that the shape of the distribution of means will be 'nearly normal', and that the standard deviation of the means will be smaller than that of the population, by a factor of 1/√n. So what? What do we gain by repeating our sampling many times. Seems like a lot of work, to what end? Then we're supposed to learn a list of conditions under which the Central Limit Theorem applies. But without understanding the point, this was too much like rote memorization to me, and why should I bother? I gave a seminar at Michigan State yesterday, invited by the Microbiology graduate students (Thanks guys!). While I was there I met with a research group that works on Actinobacillus succinogenes, a relative of H. influenze. 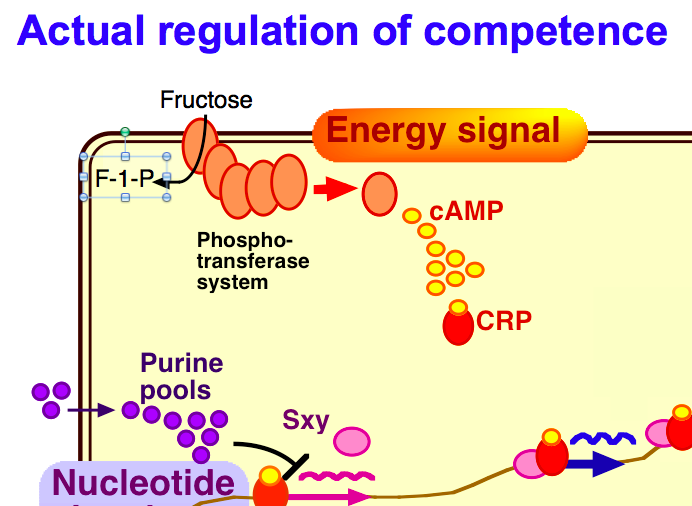 They were interested in improving the competence levels of this species, and I explained that induction of the H. influenzae competence regulon was controlled by CRP and cAMP, with cAMP levels determined by the availability of external fructose to the phosphotransferase system’ (PTS) sugar-uptake system. The PI then asked me whether we’d tested the obvious prediction that adding frucose to the culture medium should inhibited the development of competence, and I was shocked to realize that we hadn’t. At least I don’t think we have. The PTS and fructose studies were done by a very competent PhD student about 15 years ago, and I’m pretty sure I would have remembered the result of this experiment, since it would either have nicely confirmed our hypothesis or disproved it. I’ll check her thesis when I get back (I ‘m writing this in the East Lansing airport). Assuming she didn’t do this, I’ll do it right away. Two experiments really, a time course of competence development in rich medium and induction by transfer to MIV starvation medium. I’ll grow wildtype cells in regular sBHI, and at OD =0 0.2 (log phase) I’ll collect them and resuspend them in either MIV or fresh sBHI containing either fructose or glucose (as control). What sugar concentration should I use - is 0.5% standard? Hmm, I just remembered some old experiments I did (20 years ago?) testing the effect of adding glucose to MIV I vaguely remember that the cells became very unhappy - did they die from unbalanced nutrients??? I know that glycerol added to MIV doesn’t have any effect on competence (very old publication confirmed by me). I could use a different sugar (ribose? xylose? one that we know H. influenzae can use). Here's the results of the transformation time courses of the control strain 'K' (= KW20) and the hypercompetence mutants (RR735 and its backcross descendant RR753). The lower graph is just culture growth (CFU/ml). 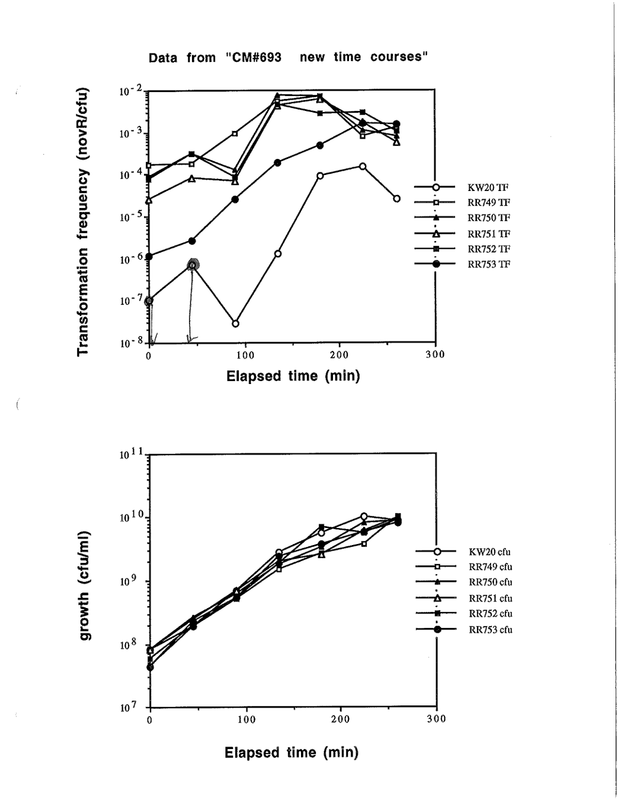 You can see that the two mutants (red and green lines) grew slightly slower than the control (blue line). The upper graph is the transformation frequencies. You can see that the two mutants behave identically, and that their transformation frequencies are 100-fold higher than wildtype in log-phase growth and 10-fold higher as growth slows. 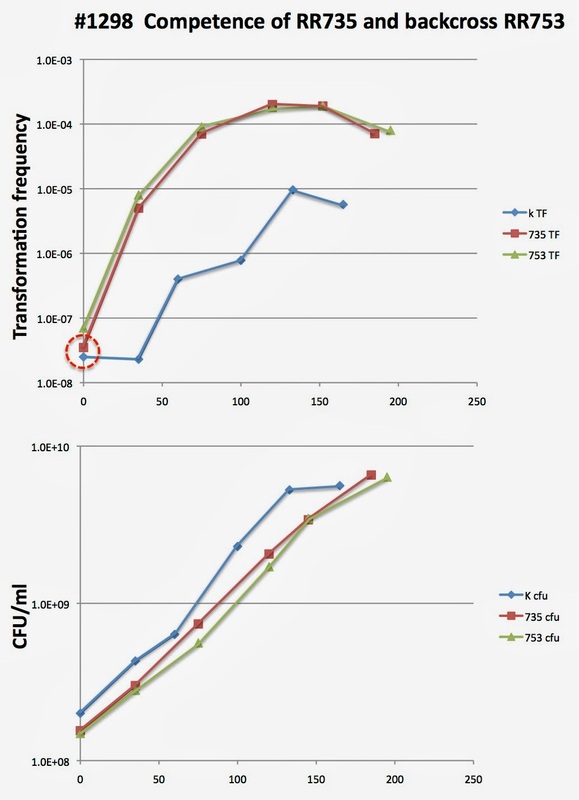 The dotted red circle indicates two samples that gave no transformants, so the values plotted are upper-limit estimates of the true transformation frequencies. I also made the chromosomal DNA preps from these two mutants and from a parallel pair of mutants whose mutation has been identified (200 µl of each, at about 150 ng DNA/µl). I set 50 µl aside for the postdoc's sequencing.